Extreme reactions to the attacks in Paris are to be expected, I suppose. But I was surprised to hear that so far some thirty-one states in the U.S. have decided not to accept Syrian refugees. 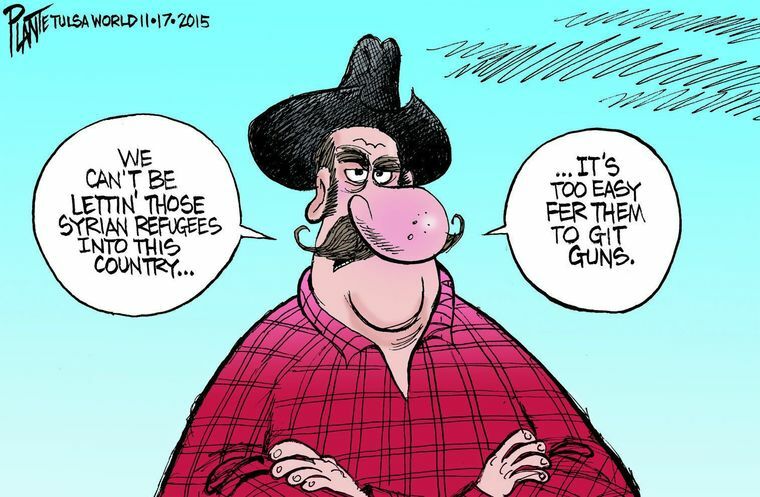 They’re worried that Islamic extremists might sneak in with the refugees and launch attacks like the ones in Paris. I’m surprised because so many states have already experienced carnage equal to or greater than that of the attacks in Paris and have hardly blinked an eye. In fact the U.S. leads the world in mass shootings. Mass shootings are defined as having four or more victims and don’t include gang killings or slayings that involve the death of multiple family members. It hasn’t been Islamic extremists who have been slaughtering little children in American schools and randomly shooting up movie theaters and college campuses; it’s been home-grown mentally disturbed young men with access to lots of guns and ammunition. The possibility of jihadists hiding among Syrian refugees is terrifying, but deranged young men with guns don’t seem to scare Americans at all. There has been no significant move to limit access to firearms or improve mental health screening and treatment. Maybe American film culture has made Americans fear the boogeyman of the horror movie much more than anybody with a gun. After 9/11, a crime definitely perpetrated by Islamic extremists, the Bush administration invaded Iraq, causing the deaths about 500,000 Iraqis and 5,000 American soldiers and the maiming and wounding thousands more. Everybody going through airports started having to remove belts and shoes, dispose of liquids and submit to body scans. After Adam Lanza shot and killed 20 children and 6 adult staff members at Sandy Hook elementary school in Newtown, Connecticut—nothing. After James Holmes shot up the movie theater in Aurora, Colorado, killing 12 and wounding 70—nothing. After Christopher Harper-Mercer shot and killed 9 students and injured 17 others at Umpqua Community College in Roseburg, Oregon—nothing. There have been terrorist attacks in the U.S. since 9/11, but most of them have been carried out by homegrown terrorists. According to New America, a Washington research center, white supremacists and anti-government fanatics have killed 48 Americans in the 14 years since 9/11. Self-proclaimed jihadists have killed a mere 26. But that paltry number of deaths from domestic terrorism pales in comparison to the 301,797 firearm-related deaths that have occurred in the U.S. in the past decade. Every time a mass shooting occurs, local officials call a press conference and heap praise on first responders, marvel at the strength of the community in the face of tragedy, and look forward to the healing process. Usually there is no promise to bring the perpetrator to justice because the perpetrator has already killed himself. This depressing ritual is faithfully covered by cable television networks, which also dutifully report calls for gun control legislation that never gets passed. But in reaction to 129 people shot and killed by jihadists in Paris, 31 states immediately act to block refugees from Syria. It’s like a man who sees his house is on fire and rushes out to buy burglar alarms. ISIS wants Muslims to be feared and hated around the world. It’s a strange co-incidence that the NRA and their political mouthpieces are such strong supporters of this move. ISIS and the NRA have much in common. Both are committed to using fear to promote their cause. So who are the real terrorists? Very good point. If nothing else, islamophobes are playing into the jihadists’ hands.